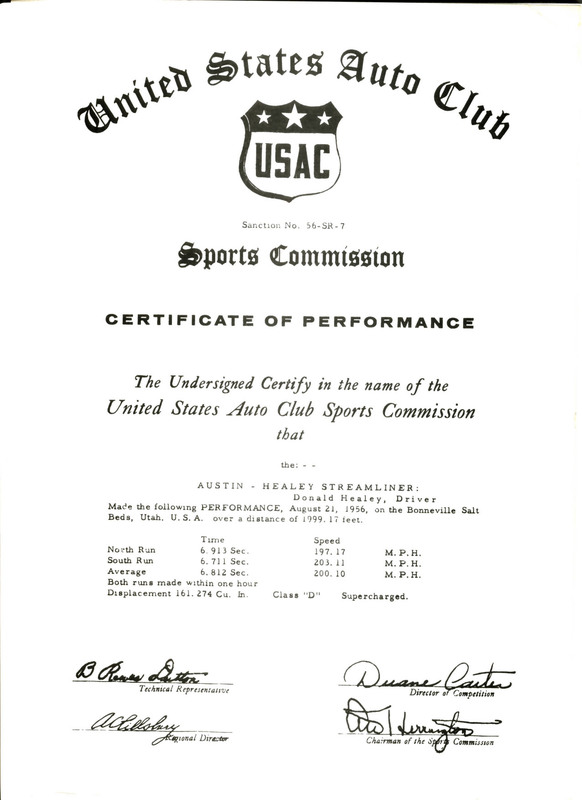 Healey was a firm believer that success on the track brings success in the showrooms ("Win on Sunday...Sell on Monday") The 1956 record breaking attempts were timed to coincide with the launch of the new 100-Six model in September 1956. 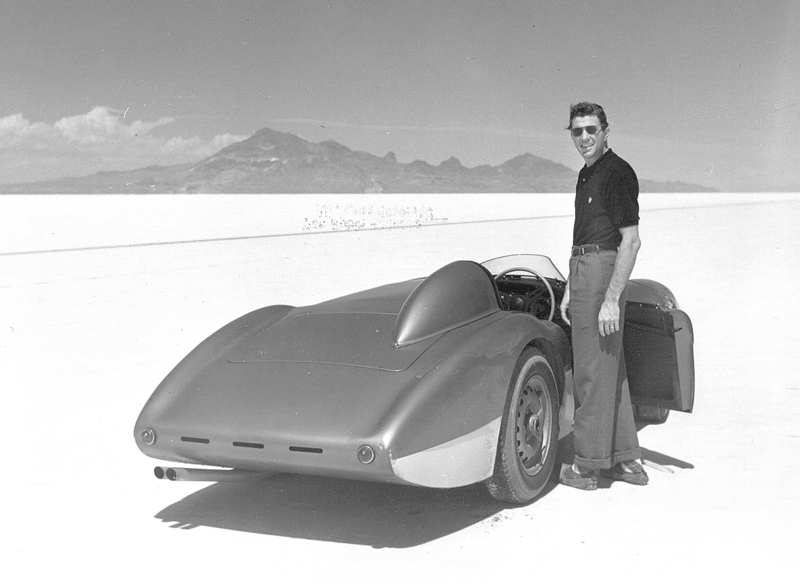 "New Power.....with the basic six-cylinder power plant that captured 28 Class D records at Bonneville..."
Test runs began on August 9th and after attaining 200mph there was a loud explosion and flames shot from the exhaust caused by a failed blower drive. The test was abandoned. After record setting with the endurance car attention returned to the speed record . Repairs on the car were carried out at at a local service station after new chains and sprockets were shipped out from England. 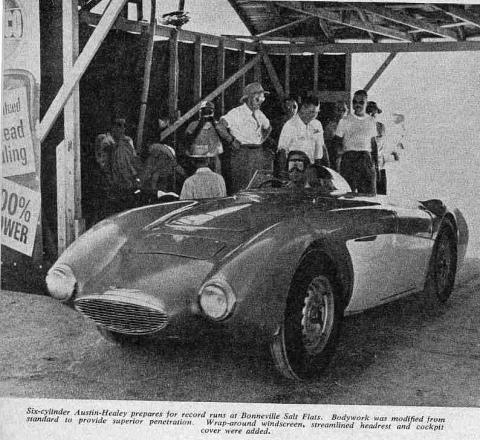 Healey took the car out for a second time on August 21st and completed the mandatory two runs, one in each direction. 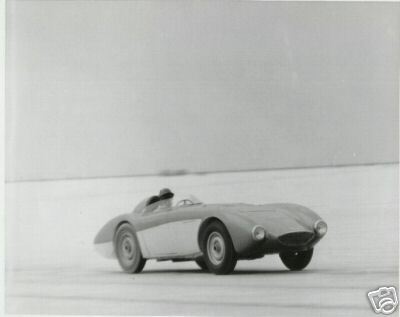 The first achieved 203.76 mph but the engine blew again during the second run with only 197.17 mph attained, however this was just enough to give a two way average of 201.10 mph and ensure that Donald Healey achieved his 200mph dream. Not bad for an Austin Westminster engine! Prior to shipping to the USA the car was aerodynamically tested extensively in a wind tunnel and the on the advice of Dr John Weaving the rear fin of the 1954 version was removed. 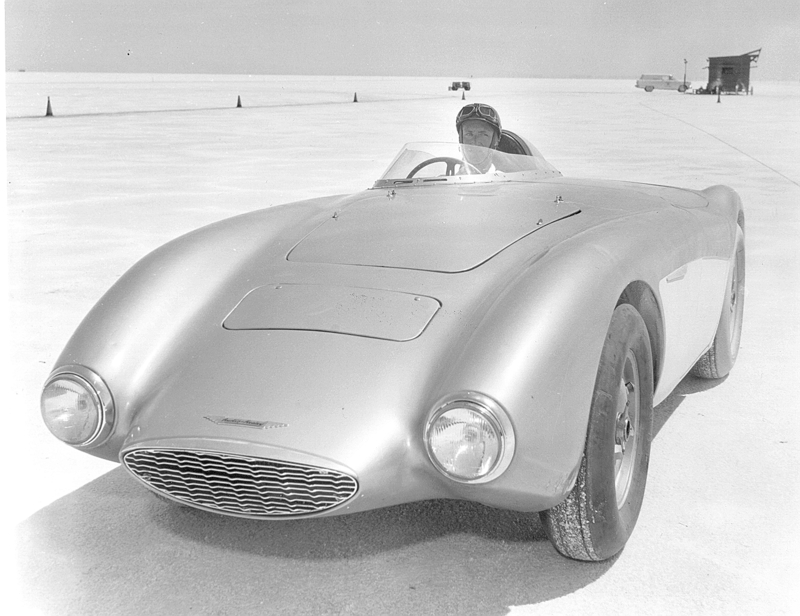 Two cars were taken to Bonneville in 1956, both fitted with the new six-cylinder C-series engine. The second car was a long nosed BN2, unblown and although the initial 100-Six was to appear with the integral manifold head, the endurance car already had the six port head and was fitted with three dual choke Weber carburettors. It had a 10:1 compression ratio and generated about 160 bhp from the standard 2,639 cc motor. Carroll Shelby and Roy Jackson-Mooretook turns to drive the endurance car and the record setting was carried out on a 10 mile circular track. The body was built by Jensen and had a cockpit adapted to be like a single seat racer. Shelby and Jackson - Moore set many Class D International and American records, most of them in excess of 150 mph which was quite amazing from a relatively standard 2.6 litre engine. The car kept going at that pace for 6 hours before the cylinder head gasket failed. The engine was prepared by Eddie Mather and produced 164 bhp at 5,500rpm running on a mixture of one third methanol, one third benzole and one third premium petrol. The testing began on August 9th and problems were encountered with vapour lock, which was addressed by cold air ducting and insulation of the exhaust. Testing resumed on August 14th but the misfire returned, this time due to a lack of compression on #1 cylinder caused by a poorly seated inlet valve. All valves were replaced and ground in with paste however it was discovered that the water passages did not line up correctly. The gasket could not be properly gripped and it was predicted to have a short life so the runs began in the cool of early morning with a restricted speed. 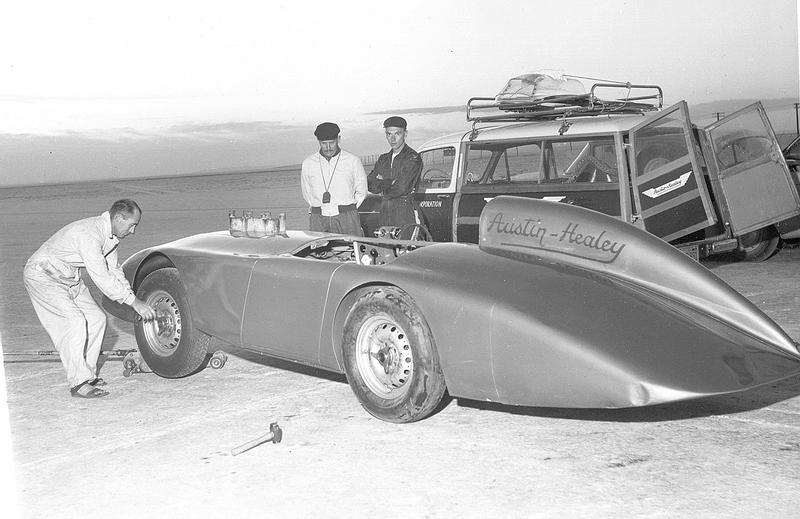 The speed was attained in 1956 and the car in question was the supercharged Streamliner which Donald Healey drove to achieve his goal of breaking the 200 mph barrier at Bonneville salt flats, Utah, becoming the 19th person to do so. Under the skin the car was based on a BN1 and had a four speed gearbox. It was however equiped with a BN1 spiral bevel rear axle, which necessitaed very careful acceleration to deal with the 292 bhp available.